Wall mounted brackets with wheel locators that can be adjusted up to 180°. Manufactured in hot-dip galvanised steel, with round tube wheel locators. Wall mounting plate secured with dowels. Compact and flexible design. 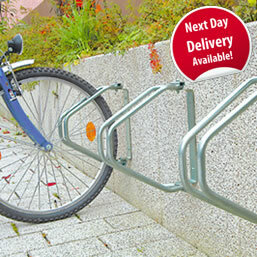 Suitable for all bicycles up to a tyre width of 50mm. Swivels up to 180°, easily adjustable and delivered as fully assembled unit ready for immediate use. Delivery weight: 2.5 Kg each. Adjustable up to 180 Degrees.